Mitsubishi Chemical Corporation is Japan’s largest chemical company, producing and supplying a wide variety of chemical products such as lithium ion battery materials, specialty chemicals, resins, petrochemical feedstocks, and basic chemical materials. 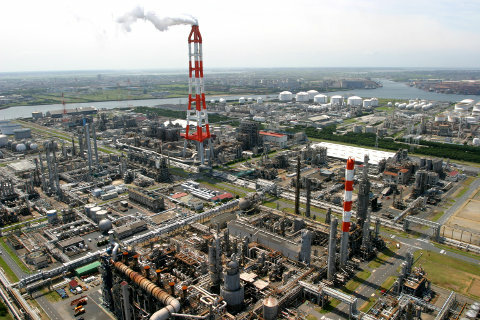 The company’s Kashima plant is part of a petrochemical complex inside the Kashima coastal industrial zone. 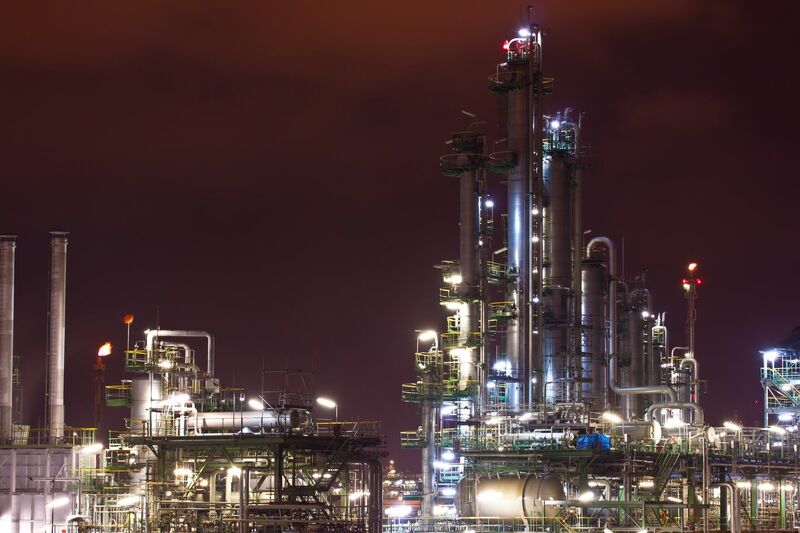 From naphtha feedstock supplied by Kashima Oil Corporation’s Kashima refinery, the Kashima plant produces ethylene, propylene, benzene, and other distillates as well as petrochemical derivatives such as polyethylene, ethylene oxide, and polypropylene. 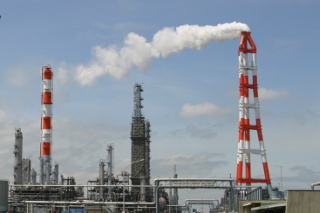 As the central plant of the Kashima petrochemical complex, the Kashima plant supplies these products to other companies located within the complex. Since 2006, the Kashima plant has made active use of Field Digital Technology to improve its maintenance operations, leveraging intelligent field devices, industry standards such as field device tool (FDT)/device type manager (DTM) and electronic device description language (EDDL), and tools such as plant asset management systems (PAM). The Kashima plant uses Yokogawa’s Plant Resource Manager (PRM) as its PAM system. PRM is an integrated device management software package and is one of Yokogawa’s key platforms for achieving Asset Excellence. The Japanese chemical industry is facing a challenging and volatile environment as cheap chemical products from mega plants in the Middle East and Asia hit the market and the shale gas revolution in the US changes the global energy balance. It is imperative for Japanese petrochemical producers to keep their plants operating safely while enhancing market competitiveness through productivity improvement. The Kashima plant is meeting these challenges through various initiatives. Masayuki Yanagisawa is the team leader of the Instrumentation Group in the Maintenance and Engineering Department at the Kashima plant. A proponent for the introduction and utilization of Field Digital Technology, he aims to improve the efficiency of basic maintenance and to introduce innovative new maintenance practices, leveraging Field Digital Technology and plant asset management solutions. The Kashima plant has been introducing intelligent HART and FOUNDATION™ Fieldbus compliant field devices that support FDT/DTM and EDDL. FDT/DTM and EDDL are common frameworks that allow supplier-independent access to digital field devices using standard protocols. At the time of writing, over 700 digital field devices at the Kashima plant are connected to Yokogawa’s CENTUM VP control system and ProSafe-RS safety instrumented system. Data from field devices are collected via a field network and stored and managed by Yokogawa’s PRM plant asset management system. Using PRM on a PC, maintenance personnel can access this information online and set device parameters. Gone is the need to take many vendor-specific communicators onto the plant floor. No need to transfer device data from the various communicators to other databases, no need for cumbersome paperwork. Furthermore, the self-diagnostic functions of the HART and FOUNDATION™ Fieldbus devices allow a maintenance crew to identify which devices are in need of maintenance. Once the maintenance work is done, parameters stored in PRM can be downloaded to devices to swiftly return them to operation. In one instance during a turnaround maintenance, discrepancies between the post-maintenance parameters and the device parameters stored in PRM led to the discovery of maintenance errors. Such improvement in efficiency through the use of Field Digital Technology reduces stress for the maintenance crew, reduces workload and maintenance costs, and improves the quality of maintenance activities. It is very convenient that a single system allows us online access to field devices from multiple vendors, enabling parameter changes and device management without having to go to the plant floor. Once you get the hang of FDT/DTM, especially DTM, monitoring devices online is relatively easy. At our Kashima plant, we have utilized this system to streamline our maintenance infrastructure and reduce the necessity for going onto the plant floor to retrieve device data, thereby improving maintenance efficiency. What used to be rather complex data management has also been simplified. In expectation of further changes in our business environment, we need to improve our competitiveness further, and I believe further optimization of maintenance costs and operating expenditures will be necessary. Today, we still rely on time based maintenance (TBM) for many of our field devices in need of periodic repair and replacement. Take valves, for instance. A breakdown of a valve can have a severe impact on plant operations, so we rely on a historical degradation model derived from past maintenance data. To be safe, we set the valve overhaul maintenance interval on the short side. However, this practice can lead to over-maintenance and high maintenance costs. If we can shift to condition based maintenance (CBM) that relies on diagnostics, we can determine the proper overhaul cycle. And even before a device is due to be overhauled, we can identify an impending failure, enhancing both the safety and efficiency of our plant operations. To realize such a scenario, we need mechanisms that can tap the wealth of data stored in PRM, allowing the creation of advanced diagnostics from data that have a close correlation to device degradation and breakdown. At our Kashima and Mizushima plants, we have tried diagnostic tests with frequently used on/off valves and impulse lines. The results of device data analysis indicate that it is possible to diagnose valve deterioration and impulse line clogging. In reality, the operating environment and risk factors that figure in the diagnostic algorithms differ from device to device, so covering all devices is not practical. However, those devices that have a significant impact on plant operations should be good candidates for CBM. CBM is more easily said than done, but given the availability of the FDT/DTM standard interface and the ability of asset management systems such as PRM to aggregate the wealth of field data collected by intelligent field devices, I believe Field Digital Technology will be able to evolve further to enable CBM and other maintenance innovations. This diagram is my image of the future of plant asset management. It would be nice if maintenance crews had access to PAM data on tablets and PDAs so that it could be utilized in their daily maintenance activities and other operations. Furthermore, vendor-provided diagnostics as well as software enabled online diagnosis should be utilized not only for CBM but also for better maintenance scheduling. A plant asset management system, if used properly, has the potential to make a significant and wide-ranging contribution to plant maintenance activities. 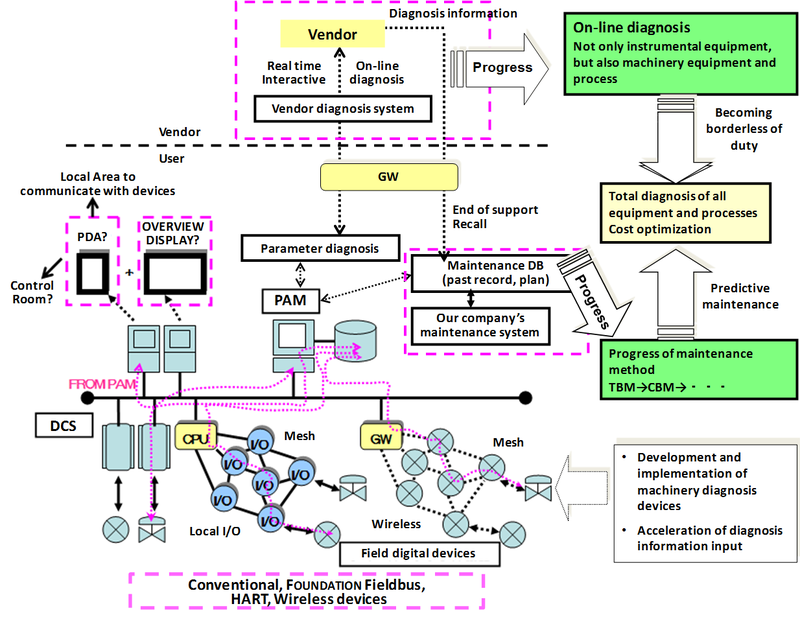 In order for us to shift from the maintenance of individual devices to the maintenance of entire plants, I’d like to ask Yokogawa to keep working to enrich its diagnostic software, propose new maintenance modes that use innovative devices, and provide new maintenance solutions that go beyond instrumentation and encompass all plant assets. This is my challenge too.